Pre-heat your Precision Cooker to the desired final temperature according to the charts in the Anova app. 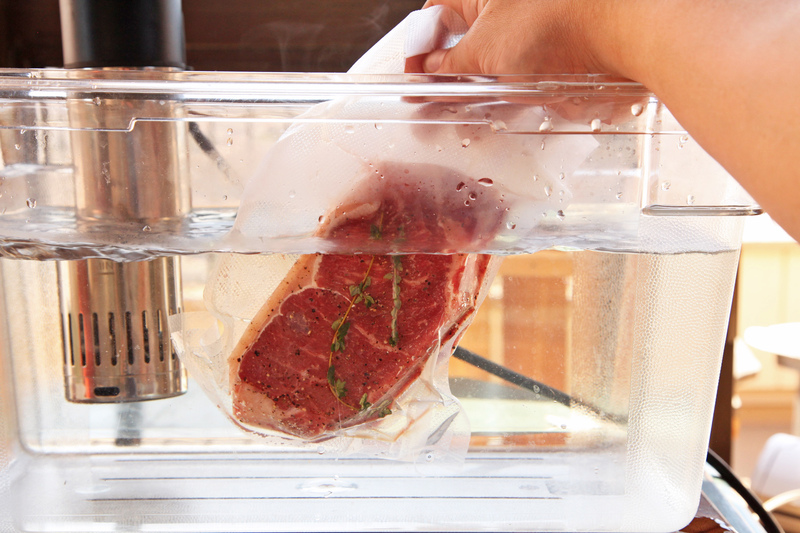 Allow the water bath to come to temperature before adding your steak. If you're planning on cooking and eating them immediately, season generously with salt and pepper then slide it into a vacuum sealer or heavy-duty plastic bag. If sealing now to freeze or cook for later, omit the salt and pepper (it will get added later on). If using aromatics like thyme or rosemary sprigs, add a few to the bag now, distributing them evenly on both sides of the steak. 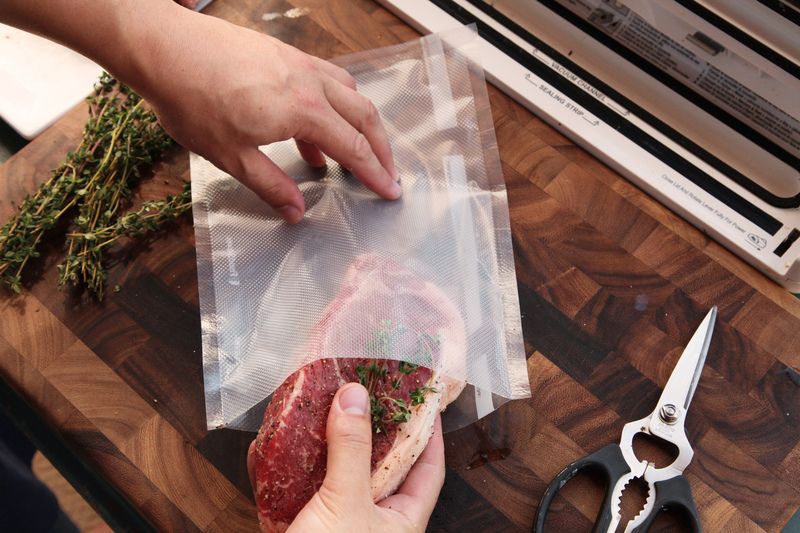 Seal the bag either using a vacuum sealer or if using a zipper-lock bag, by using the water displacement method. Drop the bag in the water bath, making sure not to block the intake or output sections of your Precision Cooker. If properly sealed, the steak should sink. Remove the steak from the bag and place it on a paper towel-lined plate. Pat it dry very carefully on both sides. If you did not season before bagging the steak, season it now generously with salt and pepper. Turn on your vents and open your windows. Place a heavy cast-iron or stainless steel skillet with 1 tablespoon / 15 ml of vegetable, canola, or rice bran oil over the hottest burner you have and preheat the skillet until it starts to smoke. Gently lay the steak in the skillet using your fingers or a set of tongs. If desired, add a tablespoon of butter. 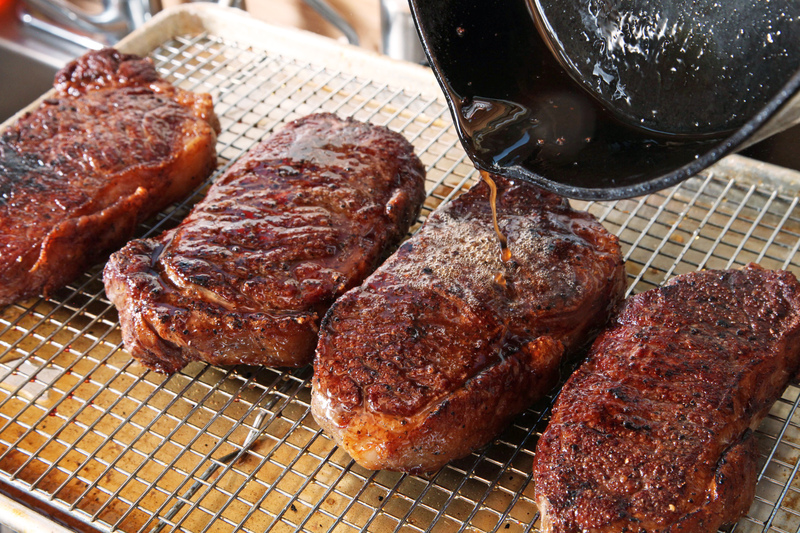 Butter contains milk solids that will blacken and char, helping your steak achieve a dark crust much faster and adding a characteristic slightly bitter, charred flavor. I happen to like this flavor (and it's typical of a steakhouse experience). For a cleaner-tasting sear, omit the butter at this stage. If desired, add aromatics like whole thyme and rosemary sprigs with the leaves still attached, sliced shallots, or crushed whole garlic cloves. 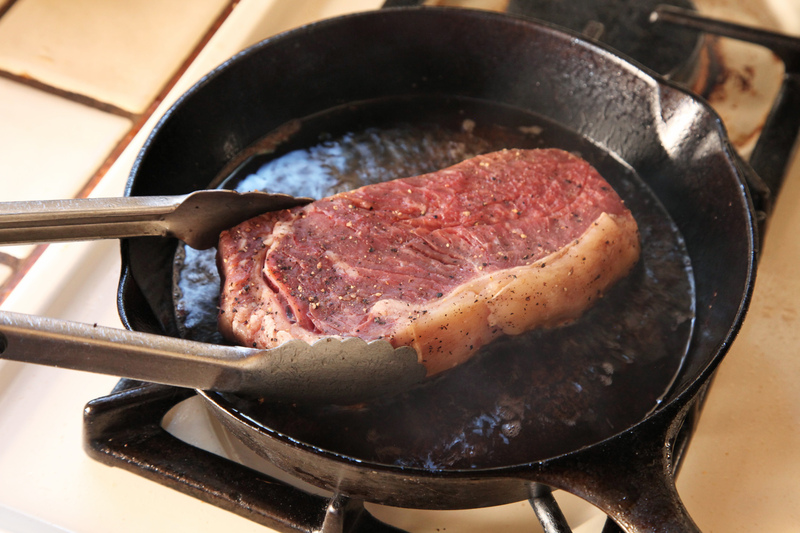 After 15 to 30 seconds, flip the steak so that the second side comes into contact with the pan. Repeat, flipping the steak every 15 to 30 seconds until it has developed a nice brown sear, about a minute and a half total. If you did not add butter in step 3, add butter to the skillet about 30 seconds before the steak is done for added richness. 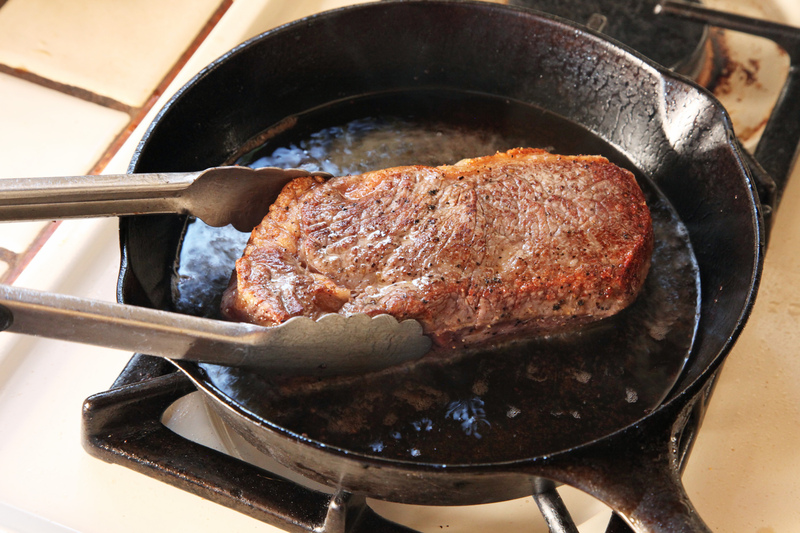 Using tongs, pick up the steak and rotate it so that the edge is in direct contact with the skillet. Continue to cook, rotating the steak along this edge until all of the edges are browned, about another 45 seconds total. 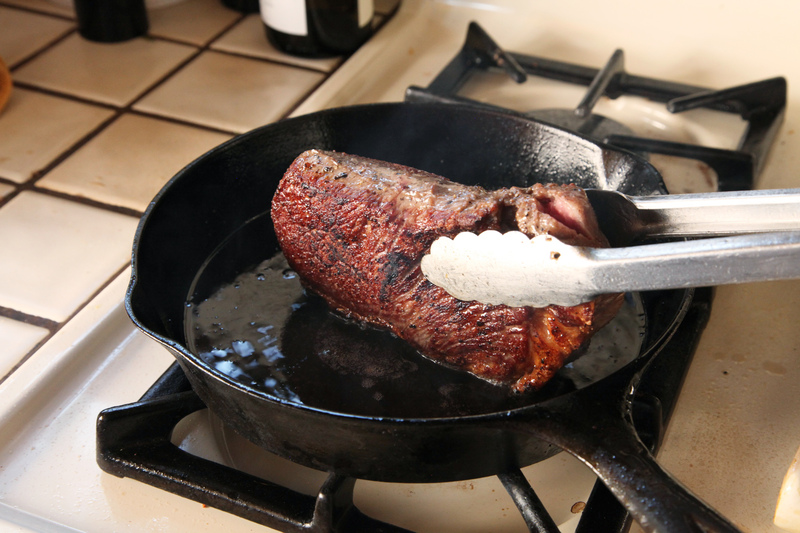 Transfer the steak to a wire rack set in a rimmed baking sheet. When ready to serve, reheat any fat and juices left in the pan until sizzling then pour them over the steak to re-crisp and moisten the surface (the steaks can be served immediately if you are ready, no need to rest a sous vide steak). 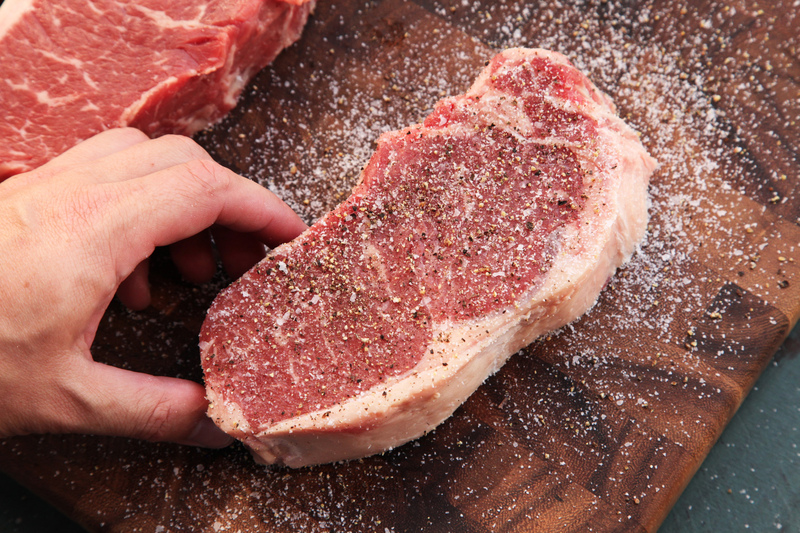 Serve steaks immediately with coarse sea salt such as Maldon on the side. Turn on your vents and open your windows. Place a heavy cast iron or stainless steel skillet with 1 tablespoon / 15 ml of vegetable, canola, or rice bran oil over the hottest burner you have and preheat the skillet until it starts to smoke. Flip the steak immediately and start torching the first side working in slow, even strokes back and forth across its entire surface until it is pale brown with a few darker singed spots. This should take about 30 seconds. If you did not add butter already, add butter to the skillet now for added richness. Flip the steak and torch the second side until it is very well browned, about 30 seconds longer. Flip the steak once more to ensure that the first side has achieved full browning. 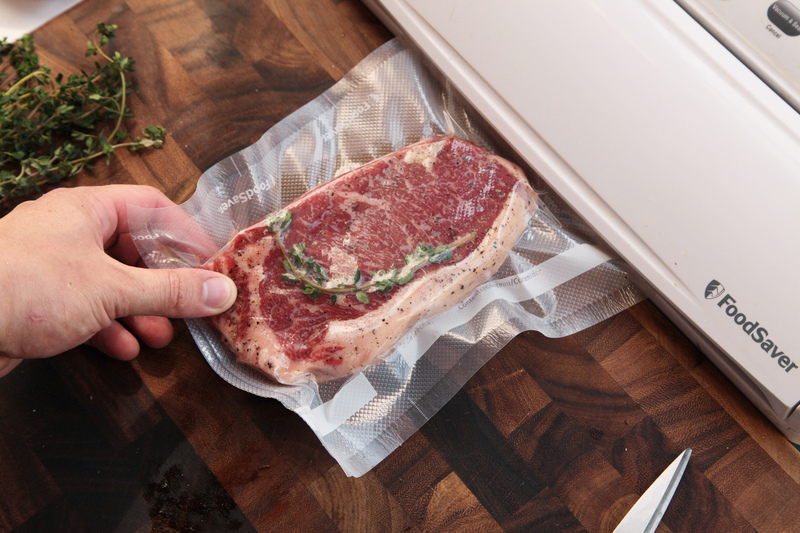 Make sure to have your grill preheated before your steak comes out of its sous vide bath and bag. Light one chimney full of charcoal. When all the charcoal is lit and covered with gray ash, pour out and arrange the coals on one side of the charcoal grate. Set cooking grate in place, cover grill and allow to preheat for 5 minutes. Alternatively, set half the burners on a gas grill to the highest heat setting, cover, and preheat for 10 minutes. Scrape the grill grates clean with a grill scraper, then oil the grates by holding an oil-dipped kitchen towel or paper towels in a set of tongs and rubbing them over the grates 5 to 6 times. Remove the steak from the bag and place it on a paper towel-lined plate. Pat it dry very carefully on both sides. Rub gently with canola, vegetable, or rice bran oil. If you did not season before bagging the steak, season it now generously with salt and pepper. 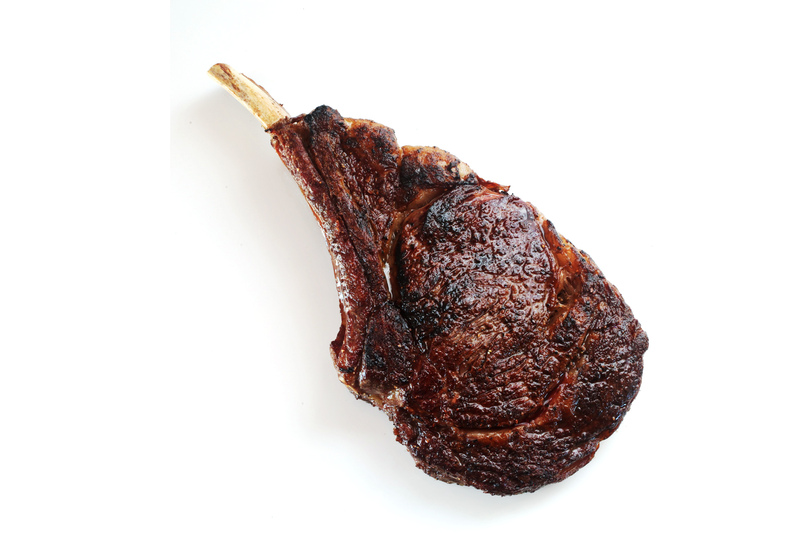 Place steak directly over the hot side of the grill and cook, turning every 15 to 30 seconds, until a deep, rich crust has formed, about 1 1/2 minutes total. If the fire threatens to flare up as the steak drips fat into it, suffocate the fire by closing the grill lid until the flames die out. Alternatively, transfer the steak to the cooler side of the grill using a set of long tongs until the flames subside. Do not allow the steak to get engulfed in flames. Transfer the cooked steak to a cutting board or serving platter and serve immediately.